Every year, the Seattle Police Foundation collaborates with local restaurants, vendors, and volunteers to feed our hard- working SPD officers in all 5 of our city's precincts. 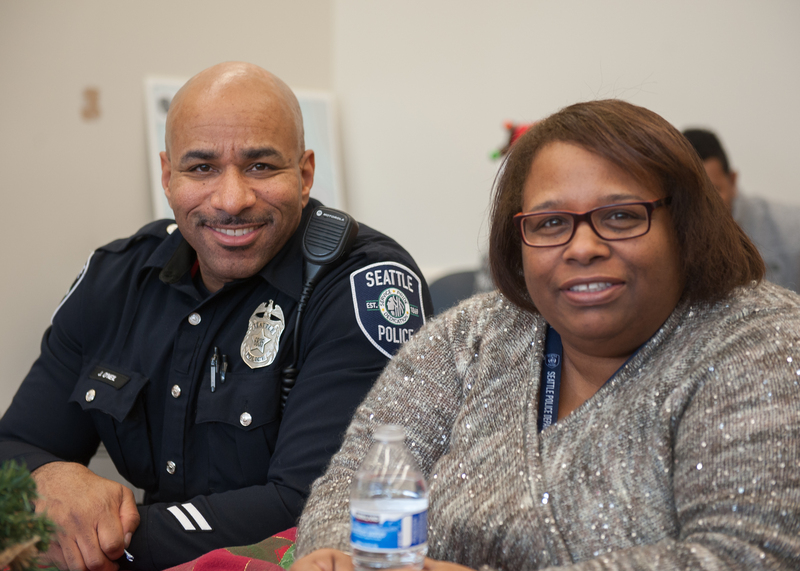 Holiday luncheons started in the fall of 2000 when Seattle Police Foundation Board member Laurie Sorensen began to provide holiday meals for the officers of the West Precinct while she was the Vice-President of Loss Prevention for Bon Marche/Macy’s-Northwest Division, in appreciation for all their hard work. Since then, the tradition has only continued to grow. Many of SPD’s officers have to miss the joyous time with family and friends to protect all of us, which is why the Foundation and local businesses provide these meals. It's a meaningful way to say thank you and show the community's appreciation. The Seattle Police Foundation works with local businesses and dedicated volunteers to serve meals to officers over the holidays. Thank you to all who generously donate their time, resources, and holiday cheer - it means a lot and improves morale throughout the Department.